During my journalistic career, I covered Super Bowls, space shuttle launches and hurricanes. I’ve interviewed Hollywood A-listers, sports icons and technology geniuses. So, why do I feel so giddy shuttling carriers containing a groundhog, a chicken and a bunch of cats from a tour bus through the backdoor of a theater in downtown Dallas? Two words: Amazing Acro-Cats. Under the direction of renowned animal trainer Samantha Martin, nearly two dozen cats (adopted from shelters or rescued from the streets) plus a groundhog named Garfield, a chicken named Cluck Norris, three nameless rats and a small crew travel all over the country inside a 45-foot tour bus to entertain — and educate — audiences about the amazing abilities of animals. 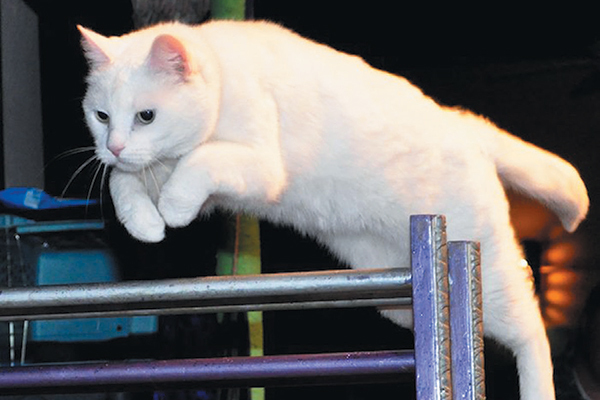 Sure, it’s tricky to train dogs to do the cha-cha in sync at national dance competitions or ace a top-level agility course, but consider the guts it takes to stake your livelihood depending on independent-minded cats to perform before sold-out audiences. But that’s what Samantha willingly does, and for good reasons, as she shares with the crowd during a recent performance in Dallas. “You can train your cats to do everything you see our cats do,” Samantha says. Photography courtesy Acro-cats. She also fosters shelter cats and kittens on the tour and has helped find homes for more than 200. 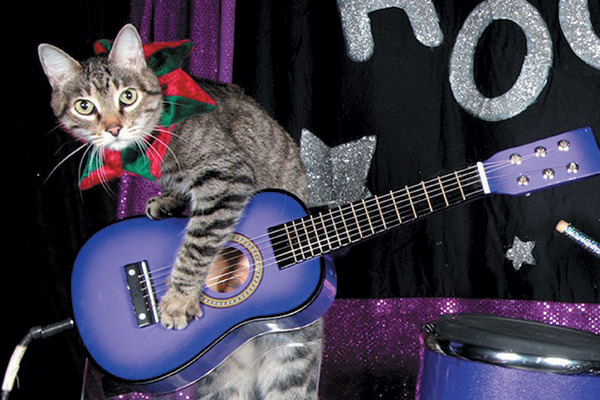 At each show, a portion of the proceeds are donated to a local cat rescue organization. 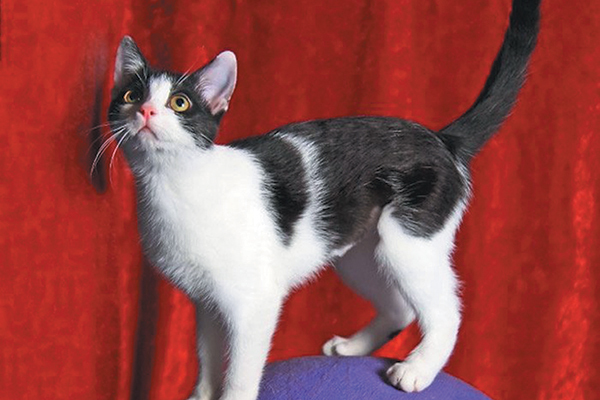 Samantha and the Acro-Cats have helped find homes for more than 200 cats. Photography courtesy Acro-Cats. I arrived about three hours before showtime and was immediately put to work placing napping cats from the back of the bus into their designated carriers and then bringing them onto the dimly lit stage. An hour later, about a dozen loyal volunteers appeared and quickly went about setting up the merchandise table, testing the sound equipment and catering to the needs of the four-legged performers. These volunteers include Kaz Ferns, who started volunteering whenever the show is in the Dallas-Fort Worth area after being awestruck by the cats a few years ago. And Jill Thompson, formerly of Orlando, who is now a volunteer in Dallas. Kaz happily confesses that she’s especially fond of Sookie, the diminutive cat who rises up on her hind legs and pushes a tiny shopping cart filled with sparkly cat toys across the stage. Jill loves all the felines, particularly Wiki, who leaves the stage and roams the rows during the show with a $20 bill tucked in his collar to inspire audience members to donate more. About an hour before showtime, Samantha is still in her street clothes as she methodically brings a cat or two onto the stage to walk through their specific talents. She is patient and doles out plenty of tiny bits of chicken as rewards. Even though the cats are in a strange place, they all appear calm, inquisitive and very attentive to Samantha, the sound of the clicker and, of course, the treats. By the time the music cues the start of the show, people are already clapping, munching on popcorn and pointing out their favorite Acro-Cat. Even when the show officially ends about 90 minutes later, people pour onto the stage to greet the cats, make donations and chat with Samantha. It’s close to midnight before all the four-legged stars are tucked back into the bus for well-deserved naps as Samantha prepares for the next show in Houston. “Yes, we are entertaining, but we are also saving lives of cats and that, to me, makes it all worth it,” she says. Arden Moore is a pet behavior consultant, author and master pet first aid instructor who often teaches hands-on classes with her cool cat, Casey, and very tolerant dog, Kona. Each week, she hosts the Oh Behave Show on Pet Life Radio. Learn more at fourleggedlife.com and follow Arden on Facebook and on Twitter at @ArdenKnowsPets.